Photo: Albin Polasek, House and Studio, ca. 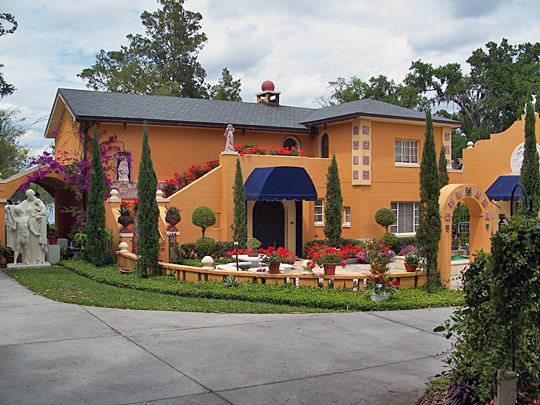 1949-1961, 633 Osceola Avenue, Winter Park, FL; Listed on the National Register of Historic Places in 2000. Photographed by User:Ebyabe (own work), 2007, [cc-by-3.0 (creativecommons.org/licenses/by/3.0)], via Wikimedia Commons, accessed December, 2015. Orange County administrative offices are located at 201 South Rosalind Avenue, Orlando, FL 32801; phone: 407-837-4005. The geographical location of Orange County, lying as it does between the St. Johns River on the east, and the Ocklawaha River and Lakes Eustis, Dora, Beauclair and Apopka on the west, gives it not only unexcelled water transportation facilities, but protection from excessive cold, and renders it the natural home of the semi-tropical fruits, particularly so of the citrus family. The county embraces every variety of land; lands suited to fruit growing, vegetable gardening, sugar cane and general farming. The healthfulness of the county is unexcelled by any country in the world. Sanford, the head of navigation for large steamers on the St. Johns River, is the center of the largest orange producing portion of the county. Within a radius of eight miles are 292 orange groves, in which are growing 165,625 orange and lemon trees, which will yield this year 2,568,000 oranges. Less than five percent of the trees are yet bearing, the larger portion being young trees which will bear fruit in from one to 5 years hence. Two railroads are completed and running in the county. The South Florida Railroad, which is completed from Sanford to the headwaters of the Kissimmee River, a distance of forty miles, runs through a thickly settled portion of the county. Four other railroads will run into Sanford; the Sanford & Indian River Railroad; Sanford, Lake Eustis & Ocala Railroad; Tavares & Lake Monroe Railroad; and Palatka & Sanford Railroad, thereby making Sanford and its immediate vicinity the center of the railroad system of South and East Florida. Improved and unimproved lands can be purchased at reasonable prices, adjoining and near to railroad and river transportation. Z. H. Mason, M.D., A General Description of Orange County, Florida, Its Soil, Climate, health, Productions, Resources and Facilities of Transportation, Orange County Immigration Society, Apopka, FL, 1881.